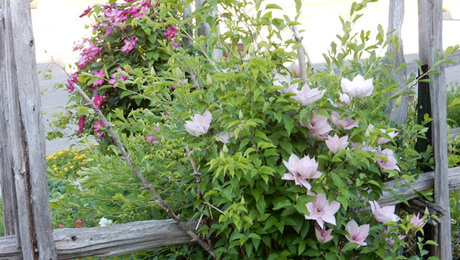 Sue Strong from Northwest Arkansas, focuses on compact varieties of clematis, which add a unique charm to pots and trellises throughout her garden. "This year has been a hectic gardening year for me here in NW Arkansas. I added over 30 new varieties of daylilies to my beds (will submit pictures next year) and over a dozen new varieties of clematis, most of which are the newer, compact forms. 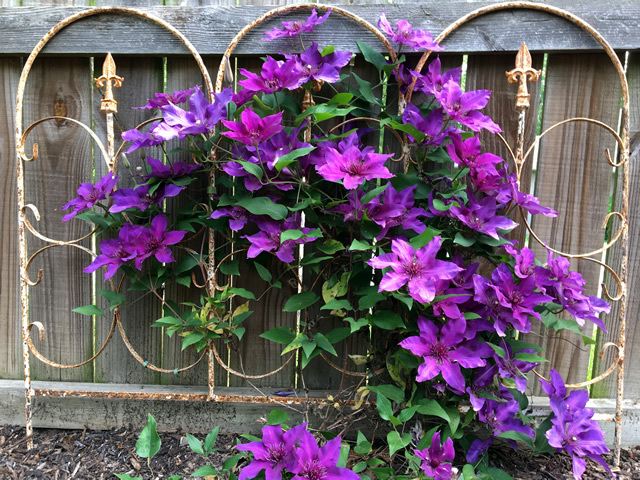 With few structures, 10 feet or taller on which to display the older and taller varieties, I have moved to shorter clematis that can be grown in pots, on small trellises and pillars, or allowed to trail along the ground. They can enhance and beautify a small piece of garden architecture and are a perfect example of “bigger is not always better”. I have found that a light pruning after their initial bloom leads to a better late-season bloom (whether they belong to pruning Group 2 or 3). I currently have over 64 clematis plants and 41 varieties, and I am compiling my 2018 “Wish List”. The clematis pictured here, were planted last year." 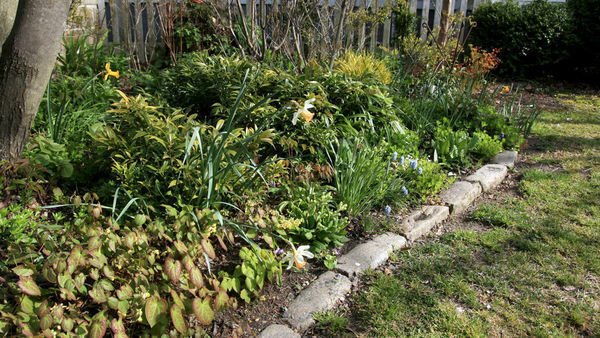 Have a garden you'd like to share? Email 5-10 high-resolution photos (there is no need to reduce photo sizing before sending–simply point, shoot and send the photos our way) and a brief story about your garden to GPOD@taunton.com. Please include where your location! Sending photos in separate emails to the GPOD email box is just fine. Good Morning Frank - yes, the birds do use all my birdhouses that are placed on six foot posts, although only one "unit" in each house is occupied at any given time. Most are occupied by bluebirds who will not use the same nest a second time so I have to take them down in the fall, unscrew the metal roofs and clean them out so they will come back the following year. But, it's well worth it. I am delighted to see your clematis photos this morning. Gorgeous! And I also admire your other garden adornments... especially the garden art with your Bijou.... that is wonderful! Where did you find that? I'd love to see more photos. Thanks for sharing! Hello Margaret - Glad you enjoyed the clematis photos. I wish I knew where I purchased that lovely garden ornament. I've had it for at least 15 years and have tried to locate the source many times to no avail. It is so well done that it looks like it was hand carved out of stone, but it is poured concrete. Beautifully done! How long do the short clematis usually bloom for you? Hello Annie - Even though the patio clematis are shorter, their blooming period is just as long as the standard varieties. I'd say the spring bloom is approximately six weeks with some variation among varieties. Beautiful photos, Sue. 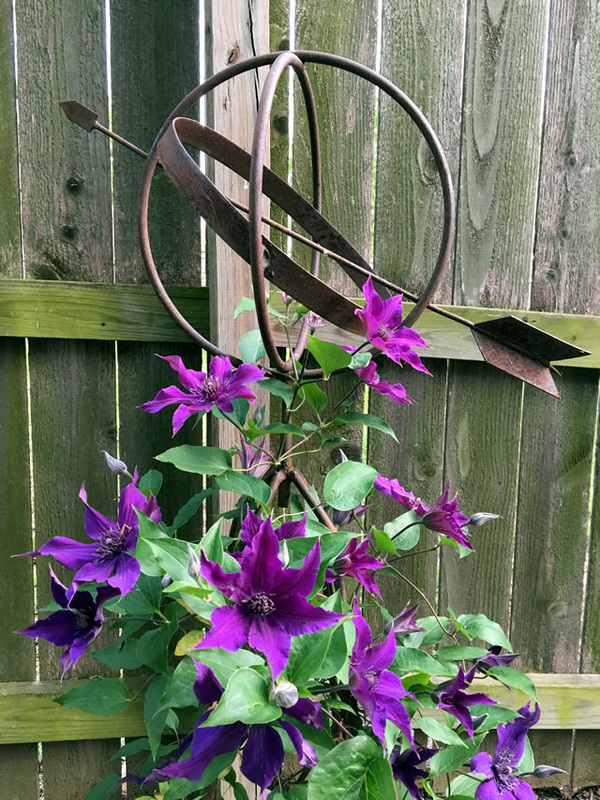 I have been trying to incorporate more clematis, and the shorter cultivars seem like the way to go. 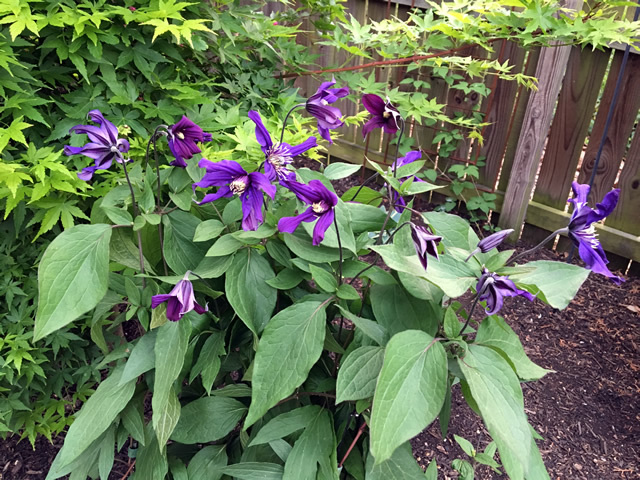 I have struggled with clematis wilt in the moist, humid summers here in Harrisburg. Any tips? Kev. - Evidently there are clematis cultivars resistant to wilt caused by the fungus, Phoma clematidina. 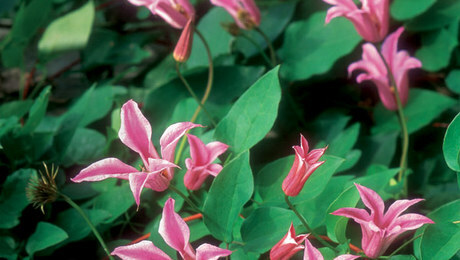 Varieties derived from Clematis viticella are almost completely resistant to clematis wilt. They are small-flowered but bloom in masses from mid-summer to early autumn and look great grown through a shrub or small tree. Good Morning Kevin - My experience would agree with Frank's comment below. I seldom see clematis wilt on my newer varieties. When a plant does get clematis wilt I cut back the affected section and the remainder of the plant seems to carry on just fine. You've inspired me to try compact clematis. You certainly have a "green thumb" for growing them. Can't wait to see your daylily photos next year. Thank you for sharing. These pictures are positively yummy, Sue, and have definitely amped up my appetite for these charming more compact clematis varieties. The combo of Bijou in front of the bright chartreuse of the heuchera is awesome and the icing on the cake is that great piece of garden art completing the vignette. I have a 'Fleuri' and I need to show it the pictures of your two bloom filled vines...mine is a slacker and needs some inspiration! Looking forward to when you feel your new daylilies are ready for their photo shoot next year. Ha, Sue, your ruefully entertaining acknowledgement about Filigree "the only thing I can say for it is it hasn't died" struck a chord when int comes to how I have felt about the performance of my Fleuri so far. Thanks for the pep talk and I will take your advice to heart. I also have a 'Guiding Promise' that, even though it in planted in too much shade, sure is gratifying for the fabulous color of the flowers. 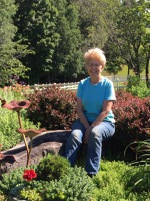 Sue, it's great to see your gardens again and your wonderful tools and watering cans! You've quite a clematis collection. Thanks for introducing me to all of these small statured beauties. I'm crazy about 'Petit Faucon' and 'Bijou'. I've got two small seedlings of Clematis columbiana that I started last fall and can't wait to give them a try, and have a tiny, struggling Clematis scottii I'm trying to convince to grow. Clematis are so much more variable and interesting than I had thought! Thanks. Hi Tim - You are correct, there is so much variety among clematis that you can find one to fit just about every location/condition. I looked up your clematis 'Scottii' and it's a real cutie. I hope it makes it! What a wonderful garden, Sue! Clematis is one of my favorite vines and yours are so beautiful! I really like the way you have placed them with the objects and trellises. There are so many different kinds and colors! Yours are so beautiful and healthy! Thanks for sharing! Hello Jeanne - Thank you for your kind words. 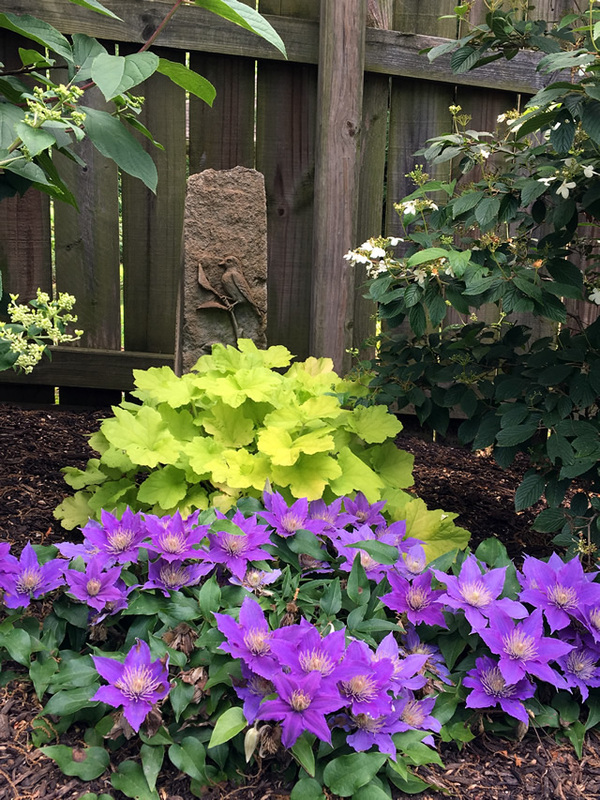 Clematis are the perfect plant for complimenting garden architecture and ornamentation without stealing the show making them one of my favorite plants. Sue, you got me wide-eyed early today. Aside from my Japanese maple obsession, Clematis are the close second. I'm such a sucker for those blooms, much like yourself I assume. So many forms and so easy to tuck in somewhere. The ones you have displayed here are just gorgeous...added a few to my want list. I've been hemming and hawing with Bijou, and now I believe I must have it. This may be a silly question, but have you checked out the Brushwood Nursery site? Thanks for sharing. Good Morning - yes, I have ordered many clematis from Brushwood as I believe they have the largest selection of clematis available via the internet. The root systems of their mail order plants are very well-developed and healthy, but they prune the vines back to a few inches which is disappointing to me. My favorite mail order nursery for clematis is Klehm's Song Sparrow Nursery. Their plants have both an ample root system and they do not cut back the vines. Their packaging of plants is second to none, however, the shipping is more expensive if you order only one or two plants. Therefore, I usually place a larger order as the shipping cost decreases (per plant) with larger orders. Such a lovely collection! Image of The Baffin rose shows great composition. Thank you. The bloom period for 'William Baffin' is quite short so inter-planting with 'Ashva' extends the color timeframe. 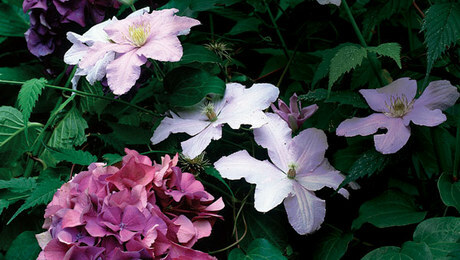 Love your garden - both the gorgeous clematis and the great garden ornaments that add so much personality and beauty! Planted 3 clematis, one at the base of a tree stump that I use as a base for a bird bath saucer, and a couple of evenings ago, a deer "pruned" it down. Hopefully it will make a comeback in the Spring. Hello Beth - Thank you for the generous compliment. Your clematis will very likely come back in the spring, but you may need to do something to deter the deer as they do enjoy snacking on clematis. Yep - this one was my fault as I have a solution that, when I actually spray it, keeps them away! So pretty Sue. 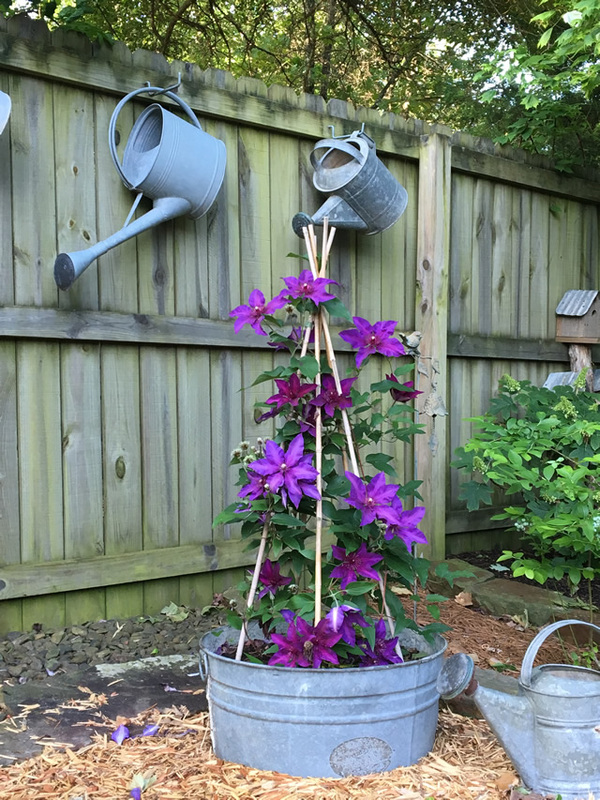 Love ❤️ your clematis and all your fun garden art. I have a few clematis and would love to get more. Unfortunately I don’t have enough sun and have too many deer. I’ll have to live vicariously through your photos. Thanks so much sharing! Hello Lori - there are clematis that are quite shade tolerant, but unfortunately not deer tolerant. Perhaps a shade tolerant variety climbing a trellis against your house or in a pot by the front door? Oh, I love that last photo, what a wonderful idea for a support structure. Here, I have a metal tub just like yours and a terra cotta finial designed to corral tripod stakes but lack the imagination to combine these elements into something beautiful. I'm saving your pic to remind me of this as a possibility next spring. Now all I need to do is kill all the deer-----seven standing around in my backyard, munching of course, last week! Sue, all your clematis are beautiful. So full of blooms and lush leaves. I planted four this spring/summer - 1 died, 2 didn't die, and the 3rd is spindly but bloomed. Hopeful for better results next year. But oh, the 'Bijou' with the Lime Rickey Heuchera and the 'Ashva' with William Baffin Rose definitely created garden lust. The 'Petit Faucon' is interesting; do you stake it or just allow it to eventually droop? Hi Sonya - don't give up hope; some clematis take a good three years to put on a decent show. That's another reason the like the smaller clematis - they usually flower quite fully in their second year. I did stake my 'Petit Faucon' in the spring, but not after I pruned it following its spring bloom. It doesn't have tendrils so I use Velcro garden tape to attach it to the stakes. Thanks for the good advice. 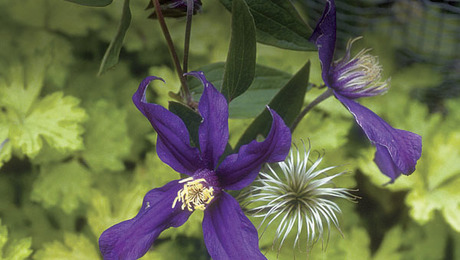 You definitely have the right touch for growing clematis. I had never thought about growing one up my armillary, but I may just have to copy your 'Guiding Promise' - armillary combo. Thanks again for you have shared today. Great way to start the week. Good morning, Sue. Your clematis are all so beautiful and happy looking. I especially like the Bijou with the heuchera. Unfortunately, our growing conditions are not very conducive to growing them since our enclosed areas are too shady and the sunny areas are frequented by deer so thanks for sharing a tour of yours. Thanks, Sue. Ah yes, Nelly Moser. We used to grow that on the front of our house in WI. It was gorgeous and the whorls left after the flowers were pretty into fall. We’re wondering if maybe the lack of heat here in the summer might be another factor. I haven’t given up yet, though, and will look into your suggestions. Your clematis are simply lovely. I also love all of your whimsical garden decor- like the galvanized watering cans and the rusty, old gardening tools on the fence. I too am a collector of daylilies and would love to see yours next summer. Thanks Joanna - I love collecting vintage garden tools and have them displayed all around my vegetable garden and garden shed (inside and out). I had a bit of a problem with daylily rust this year but am hoping for a cold winter which is supposed to kill the fungus. I am in zone 6b which should not have a problem with daylily rust, but I ordered many of my new plants from zones 8 & 9, so I may have "imported" the disease. Hopefully, my plants will be disease free and ready to be photographed next summer. I love your yard. How cute all your yard art is. The clematis are stunning. Probably my 2nd most loved perennial is clematis. First being hydrangea. Your Yukikomachi is so beautiful. Vikki in VA.
Beautiful displays of your Clematis Sue and thank you for all of the names of shorter possibilities for gardens. Really enjoyed your photos and your very artistic arrangements. Thank you for the kind compliment as I know you are an accomplished gardener. What a fantastic collection of Clematis! Your entire garden is wonderful! Thanks for including info on where to find them. Thank you Fred - I enjoy sharing plant and purchasing information. 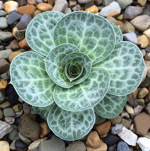 It's so frustrating to see a beautiful plant and not be given its name. Wow, Sue. What stunning Clematis. I love seeing them each nestled in to their spots so happily. I've been leaning towards the shorter varieties as well for the same reasons. 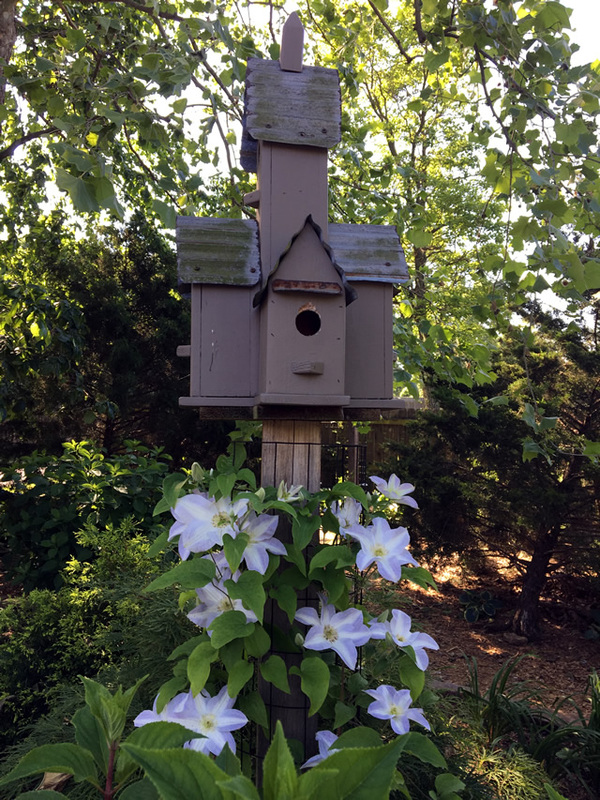 I love my Clematis 'Rooguchi' that drapes our mailbox every spring and summer and blooms on and on. I'd love to see more photos in future of your gardens. Hi Marge - I, too, love 'Rooguchi'. What a great and lovely performer! I usually submit photos twice a year and will try to submit another set of 2017 photos soon. This was such an busy year that I got a little behind. I enjoy sharing pictures of my garden with other avid gardeners as much as I enjoy having them share theirs. 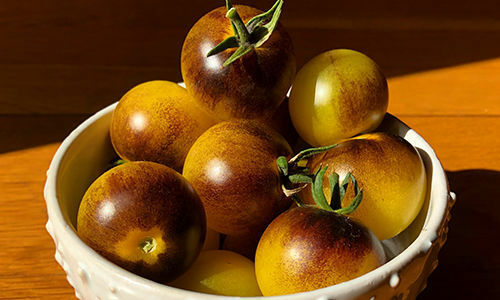 I love 'Rooguchi', too, for its exquisite bell shape and two-tone purple beauty. Each flower is a little work of art. Greetings from southwest Missouri! 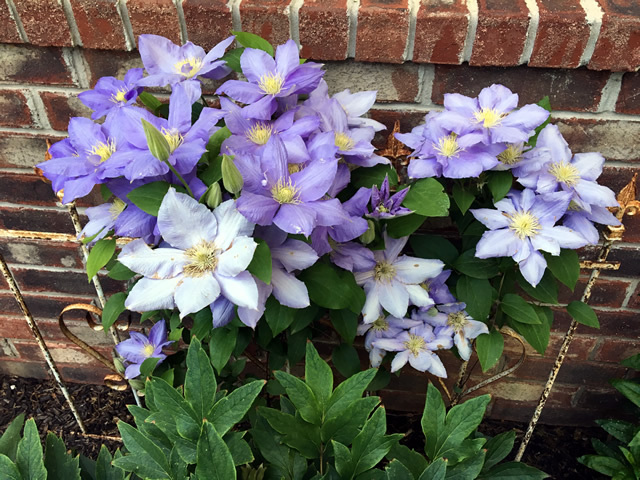 Thank you for your promptings and saleswomanship on behalf of compact clematis! I, too, am inspired to try one or two new ones. I was particularly taken with Petit Faucon - is it actually growing without any support? 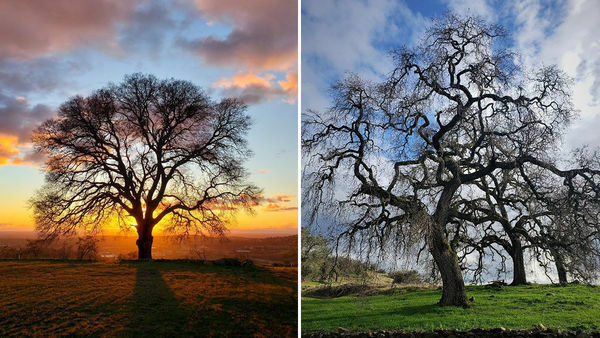 I'm going to have to bookmark this page to come back to in the spring - definitely some wonderful inspiration! And, I may have to replace my Niobe, as it just isn't very happy this year, though prior years it has been fabulous. Hello Neighbor! I put a very small trellis behind 'Petit Faucon' and secured the vines to the trellis with Velcro garden tape. After it's first flowering, I pruned it and removed the trellis to let the late summer/fall growth lay on the ground. 'Bijou' is my favorite clematis for growing without support since it makes a lovely round "clump" all on its own. I wouldn't give up on your 'Niobe'. Cut it back to the third set of "fat buds" in late winter/early spring to rejuvenate the plant. 'Niobe' is one of my best performers. Thanks again - for customized advice and encouragement - I've not given up yet on Niobe, and usually cut back just the dead stuff, so I'll try it your way and see what happens. You think I should try feeding it? Maybe some well composted horse manure? It has a place of honor, so I really want it to shine! Yes, a little extra fertilizer next year may help indeed. 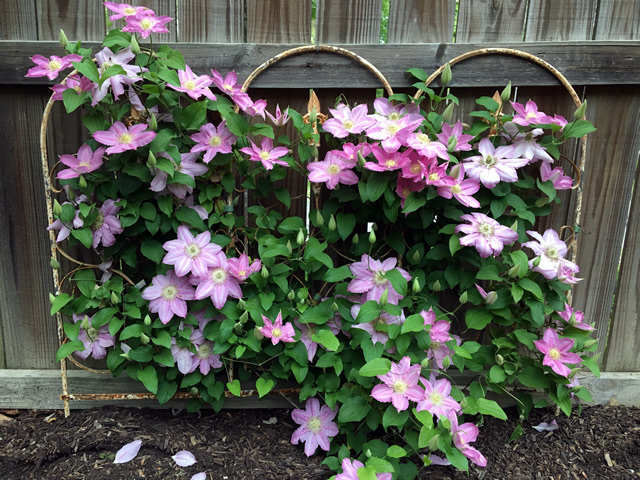 I put down a generous layer of compost every year, but I think clematis benefit from some additional fertilizer - perhaps a slow-release fertilizer in the early spring or occasional feedings of liquid fertilizer especially before and during the bloom periods. According to all the literature they are heavy feeders. Fabulous photo composition and selection. Beautifully done! I'm late to join the party, but without reading anyone's comments that must be stellar... The way you balance your plantings, your choice of plant materials, your sense of balance and your innate sense of whimsy always brings a big grin to my face. Brilliantly done and thought out. Thank you. I do love your work and passion. Thank you Sheila. The compliment means a lot coming from you. Your work is beautiful Sue, and that says it all. May I add... keep posting! Really enjoyed all the photos and great information. A local garden club is hosting a clematis expert for a talk tomorrow, and I can't wait to learn more. I have "Cezanne", but it's been in the same container for years, and i plan to find a spot for it in the ground, but "Bijou" has been added to my "Lust List" Thanks so much. 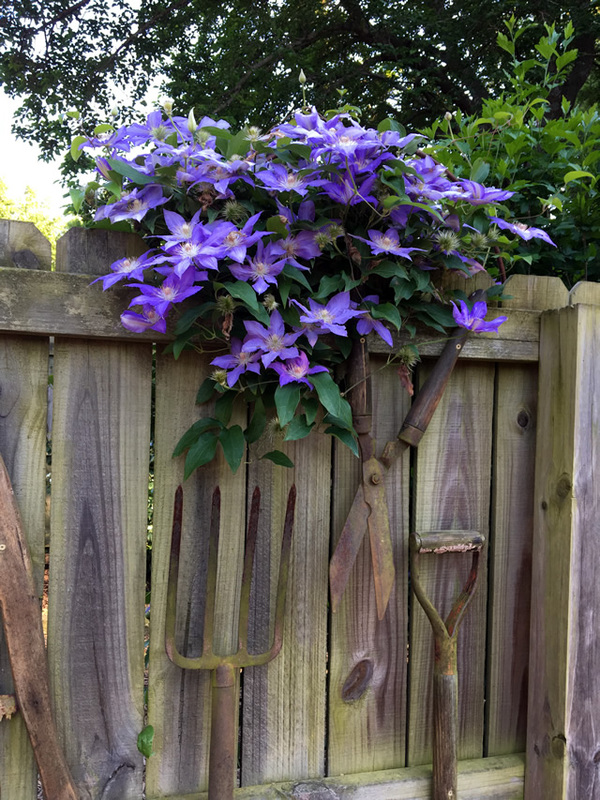 I love these Clematis photos and your yard art. Very nice!! 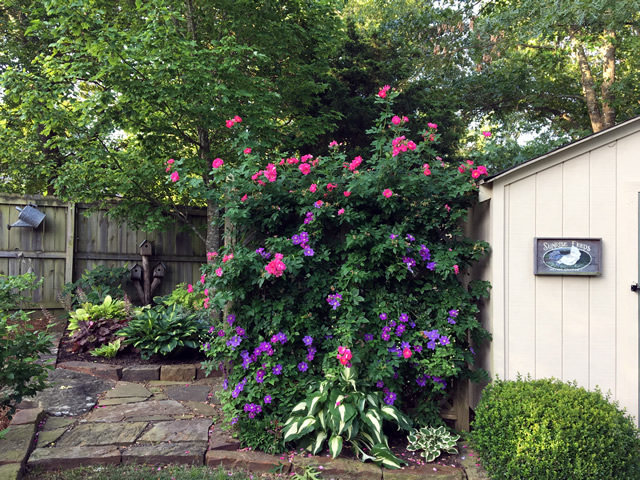 Sue, your clematis look so full and healthy and are so artfully displayed! A collection of 64 clematis plants is quite a collection, but I can understand how you'd still want more when they are as lovely as this. One of the benefits I enjoy of this posting is the educational aspect....altho the eye candy never disappoints!! and inspiration of how to further develop our young gardens! You have opened my eyes, Ms. Strong, and I too will begin looking for some of these jewels!! In that regard, thanx for the source information!! In that vein, but on a slightly different track, I'm hopeful that one of the nurseries you've indicated will carry and offer my favourite full sized specie: C. montana! I had one when I lived and worked in OKC, but that was last century!! Finding the simple white one has turned into quite the treasure hunt for me! Better get to bed a-fore I end up snorin' at the keyboard.....again....We live across the state line 'bout a half hour in NE Oklahoma. We, and you, I reckon, have our first freeze coming this weekend. My garden's almost ready for the cold....almost... but still have a few more contained treasures to get inside, some things I hope to get cuttings from before they turn crispy, and a handful of small individuals I hope to dig and perhaps coax one more season from them!! Nite, Ms. Strong, and again, thanx!! Good Morning Jesse - thanks for all the kind words neighbor! I just checked and Brushwood Nursery offers about a half dozen varieties of white Clematis Montana. They are all showing "Sold Out" now because it's the end of the year, but visit their site in early 2018 when they have their new offerings listed and place your order early to make sure you get the one you want. They will not ship it until the date you specify. Their plants are a bit pricey, but shipping is included. Good Luck! Thanks Diane - I will try to send in more photos soon. I'm behind on loading them into my computer. I, too, love the rustic/country look because it creates a warm and inviting environment which reminds me of my childhood in New England. Love seeing your garden, Sue. Hostas, daylilies, clematis, you always have such inspiring photos. I've bookmarked your posts to use as references. Stunning, Sue! I second Linda’s appreciation of Bijou and the lime heuchera; I also love the combination of Ashva and William Baffin. Thanks for sharing! Beautiful! Do you have special soil? Here in Bergen County NJ I have very poor success with Clematis. What is your secret? You have a very beautiful garden and garden ornaments even without the Clematis but Clematis is sure made a show case. I like the fact that not only you sent in great photos along with the names but also gives the heights. Thanks so much for sharing and I somehow missed this post.